There I was, minding my own business, walking around a Shall-Remain-Nameless store with my writing pal, enjoying the conversation far more than the red-and-green visual overload, when what to my wandering eyes should appear...but items that sent my overactive imagination into fits of laughter and wicked delight, only to find my mind had gone sprawling down the path of goofiness. Oh wait, that path is well worn. Yup, my mind goes there and back again so much the grass won't grow. 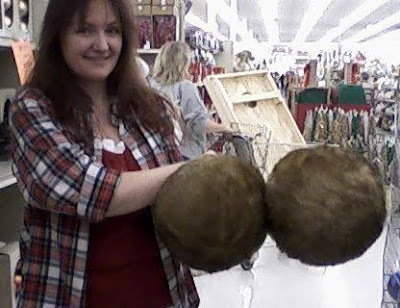 Check this out: Big Furry Balls. Available in two sizes, no less. My plaid flannel fashion aside...I can't decide. Do these things need some googly eyes hot-glued on? Or do you think these furballs need to stay on the store shelf in case the werewolves they were snipped from come looking for them? I received the most adorable invitation in the mail and it is mega-cool in 3 ways--a feat that your average piece of mail simply cannot compete with. First, this thing was hand made. HAND MADE. Read that again. HAND MADE. Someone, in this busy world of ours, someone with small children, took the time to MAKE this adorable invitation. Second, this is well done. Did you notice the little cookies? The detail on the gingerbread man? Maybe you can't see it in this picture, but OMG, is he cute! Being totally artsy myself, this is one of those things I can point to and say, "That is awesome," with a certainty that you should all simply accept. :-) For clarity, I have sons, not daughters, so 'scrapbooking' and this kind of craftiness is...well it's not going to happen in my world. So, when I see this, it's special. It's not just a paper card or invitation. It's a show of talent that speaks of time-taking and care. It's technically still just paper and ink, but somehow it's...warmer. And third, I've been invited to a cookie exchange. I've never been invited to a cookie exchange. I love to bake. Cookies, brownies, cakes, cookies, and oh, did I mention cookies? (Notice pies are not in that list...) I make oatmeal scotchies with chocolate chips and pecans that my kids swear should be sold in stores. And that is high praise coming from the Oreo fiends I'm raising. Imagine how YOUR friends would feel if you spear-headed such brilliance as this in your circle and invited them? Even if they're not bakers per se, they can do the cookie dough roll from the store and add little candies to the top or something, right? Cookies can be as easy or as involved as you want them to be. You choose. And since the holidays are about spending time with the people who matter to you, combine them. There you have it, my nudge towards peace and goodwill in the name of cookies. The leaves are raked. Let me say I love my boys, they are typically wonderful helpers. The youngest, we'll call him Future Stunt Man, was up this morning, breakfasted, and ready to rake WAY before I was. But I consented, only half way through my peppermint-choco-java fix . We raked. He's a dandy little fella. Other than taking advantage of this fabulous weather to do the outside work today, I've been deciding on a con schedule for next year, and updating the website for a big reveal late next month to celebrate the coming release of Hallowed Circle. Yes, we're almost there! (It's available for pre-order...as is Fatal Circle, the third installment for the Circle Series.) I'm working on book four...we'll keep the title a secret for now... HA HA! And also doing a little work on a side project-mwahahaha! Yeah, I'm chugging that much coffee.